← Taipei, an Inner Journey! A surge of muddy water roared, gurgled and fanned out into the sea. Our vantage point atop the Muscat-Sur highway kept us away from the currents, but not from the rain. Dark clouds poured as we peered at the submerged low-lying road below us that ran parallel to the shoreline. 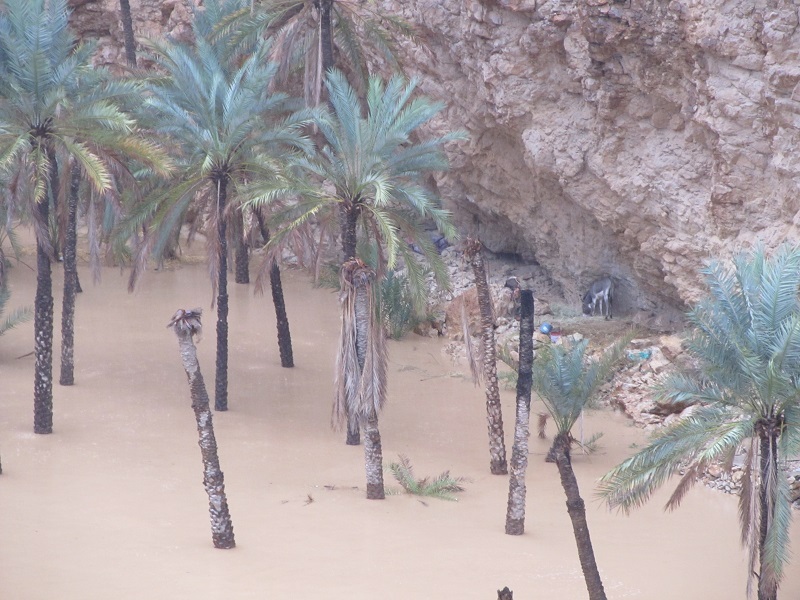 We were observing the infamous flash floods of Arabian Wadis. I ran across to the other side of the road to see the swollen gorge called Wadi Shab. Beside the submerged rocks and palm trees stood a donkey. As the water level rose, the beast clamoured higher; the smell of mud and sea licked its nostrils. It was trapped. That day we were in a nightmare, but the previous day we were in a dream. 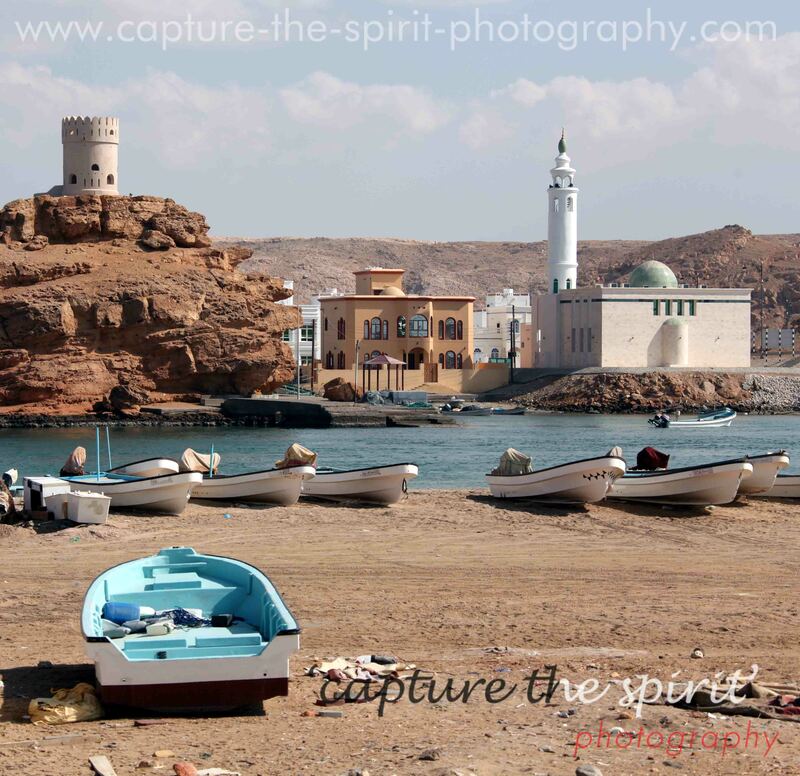 Sur stood at the eastern end of Oman. White watchtowers sat atop the craggy cliffs overlooking the harbour and the shipbuilding yard. 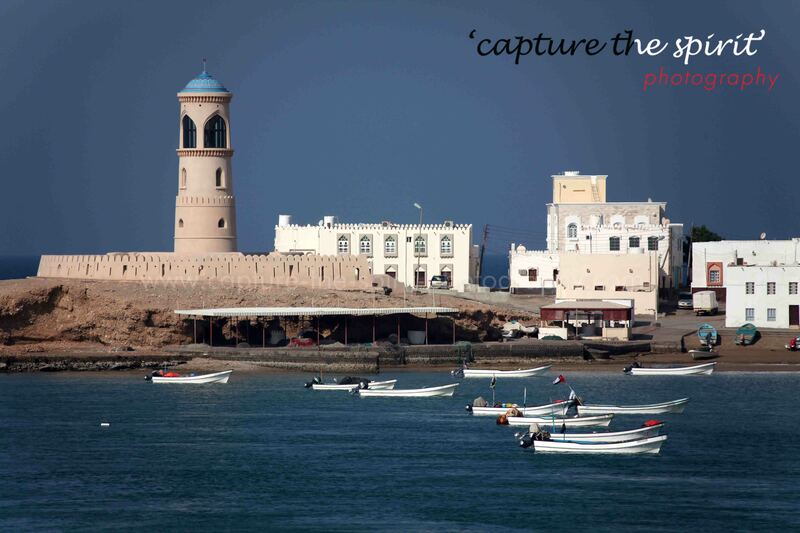 On the tongue that stretched into the sea was Al Ayjah lighthouse reminding the town of Portuguese influence. It was established in the 6th Century A.D. The port was a centre of slave and spice trade, connecting Zanzibar to India and the far east. Perdition of Sur had multiple reasons. The ban on the international slave trade by the British in 1833 was a major one. Besides, the demand for dhows decreased with an increase in the usage of steam ships. 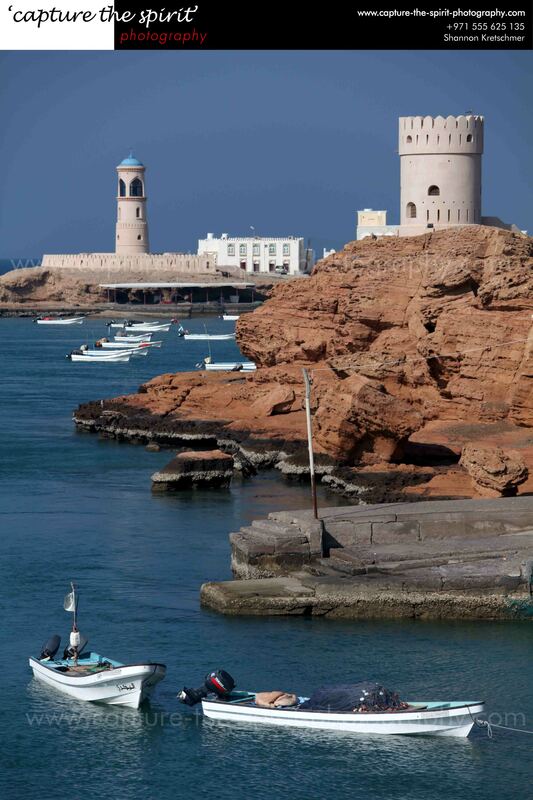 Sur still flaunts its watch towers, and its status of having the largest dhow building yard in the world. The once bustling trade centre has become a lazy coastal town, where men play cards by the water. 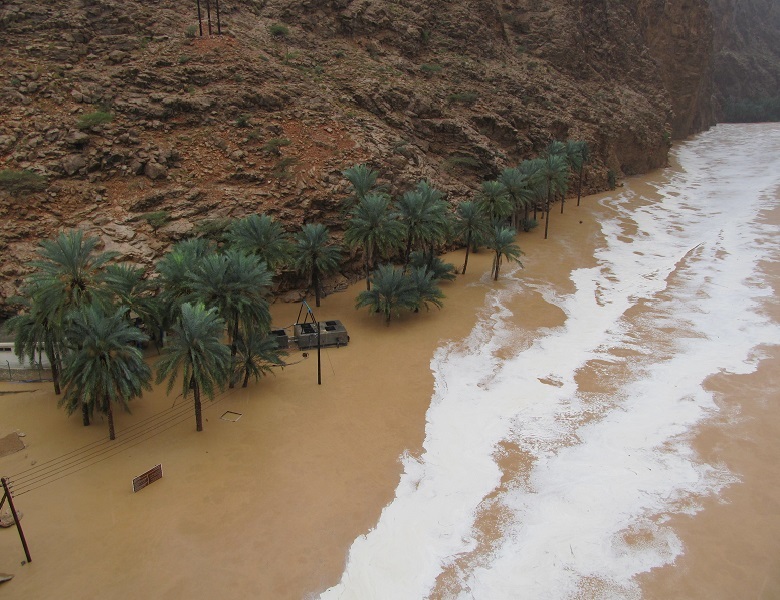 Numerous wadis, mainly Shab and Tiwi, lined the shoreline between Sur and Muscat. About 80 kilometres away from Sur, right next to the Muscat highway was Bimah Sink Hole. Hawiyat Najm Park stretches around the limestone crevasse. Flights of stairs lead towards the turquoise pool of water that smelt putrid; either because of the tourists’ trash or because of the sulphur deposits found in the pool’s depths. 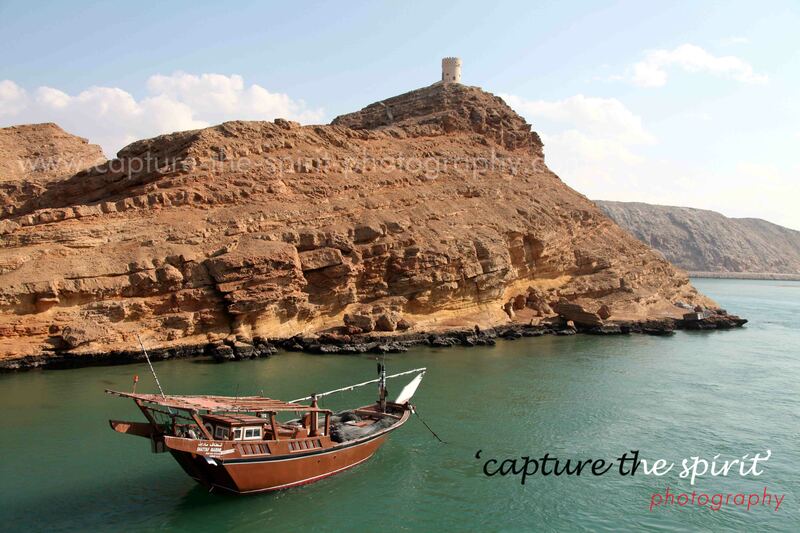 The previous evening, before the deluge, we had driven towards Muscat. We stayed overnight at Wadi Shab Resort on the highway. 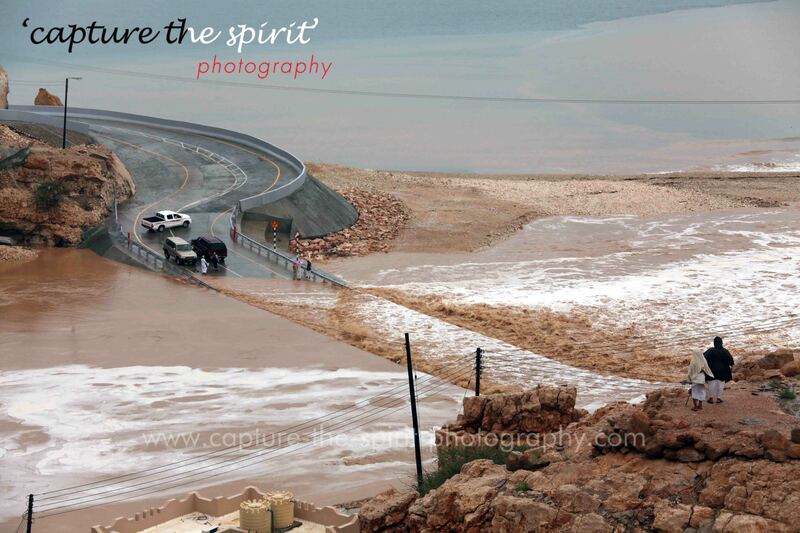 We planned to visit Wadi Tiwi and Wadi Shab in the morning. It was getting dark, so we did not venture into the valleys. Later at night, the heavens had burst open. The turbid water below us was a contrast to everything we had witnessed the previous day. 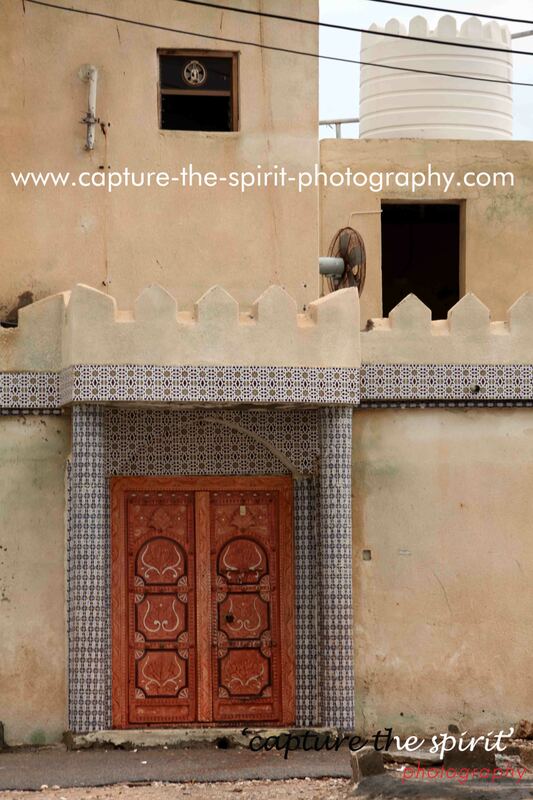 I recollected our drive through the interiors of Oman. There were warnings to avoid the road if the water level was above the red level marking. The thought of a flash flood in an arid land had been unimaginable. We stood corrected on the highway alongside a line of cars. Soon we had a reason to be glad. The water level decreased, and the once submerged roofs and palms became visible. The donkey lived another day, and we continued on our journey towards Muscat. 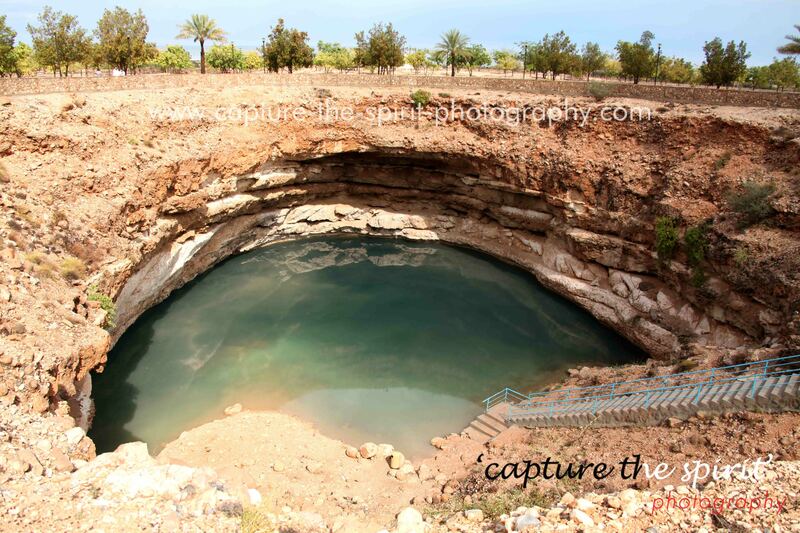 This entry was posted in Travel and tagged #oman #sur #wadi #sinkhole #arabia. Bookmark the permalink. The description is impressive because of combination of history,geography and immediate present.Blessings. Thanks Maniparna. I am glad that you enjoyed the write up. I have been good and experimenting with flash fiction and short stories; next month I will start my novel, fingers crossed. Thanks for your support…will keep you posted.